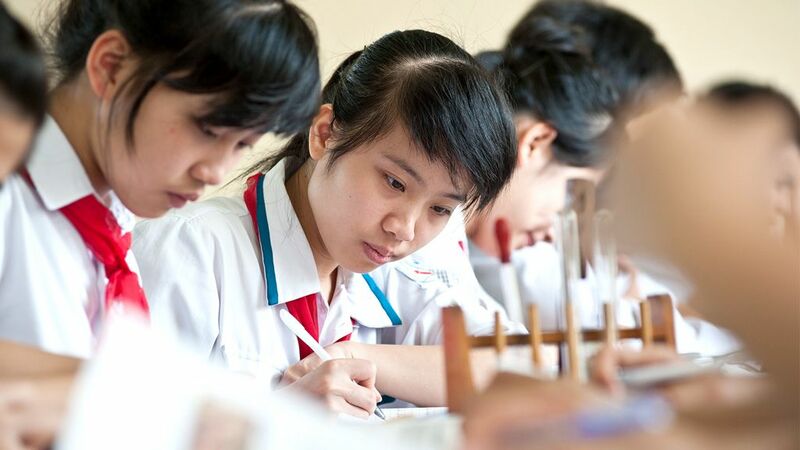 Viet Nam has made considerable progress towards improving girls’ access to education: almost half of the students in both primary and secondary education are now female. However, disparities in the quality and accessibility of schooling persist in rural and mountainous areas, especially among ethnic minority girls and women. In 2007, the Asian Development Bank (ADB) funded a project that aimed to improve the lower secondary education participation rates, particularly for girls and ethnic minorities in the disadvantaged regions of the country. Ethnic minorities, who make up about 14% of the population of Viet Nam, are some of the most vulnerable and poorest people in the country. They often live in remote mountainous areas or on lowland river deltas with very limited access to government services and education. Despite government initiatives to provide access, equity, and participation in secondary education, discriminatory practices and traditions still undermined the rights and needs of ethnic minorities’ girls and women in a number of remote rural areas. A low value is placed on education because of a perceived lack of relevance, especially for girls, who in some areas are expected to marry at a young age. The factors affecting gender disparities were most prevalent in regions with large minority populations. Education and training, which can lift many of them out of poverty over the long term, are a constant struggle. For many of these students, school is out of reach due to poor roads, long distances from populated areas, and language and cultural barriers. Ethnic minority children, particularly girls, are often forced to drop out of school or never get the chance to attend one. The Lower Secondary Education for the Most Disadvantaged Regions Project aimed to achieve universal lower secondary education and, hence, greater social and economic inclusion for Viet Nam’s disadvantaged groups. pilot-testing innovative initiatives including school feeding and awareness-raising programs to promote secondary education especially for girls and ethnic minorities. 50% female beneficiaries in scholarships and school feeding. The construction of schools and classrooms in remote areas provided opportunities for girls and minorities to enrol in secondary schools without having to travel far and worry about their safety. In areas where schools are far from their homes, boarding facilities were established. Separate toilets for girls and boys were also constructed. This safe school environment encouraged parents to send their daughters to school. Likewise, schools initiated gender-responsive management practices, such as allocation to girls of new boarding spaces and toilets that are near teachers’ rooms, to further enhance their safety. Four hundred girls out of 800 Lower Secondary Education students were awarded scholarships. The project’s school feeding program also provided an important incentive for parents to send their children to school. All students repeatedly referred to the quality and quantity of meals as well as the range of nutrition as "better at school than at home." Likewise, the awareness-raising campaign through booklets, posters, and other materials contributed to increased enrolment among ethnic minority students and girls, decreased repetition rate, and decreased drop-out rate. The communities’ growing support to encourage children to attend school and families’ increasing concern for their children’s education are indicators of the effectiveness of this initiative. Overall, the project trained 1,028 core teacher trainers on subjects such as: student-centered methodologies; continuing professional development; effective use of new materials for disadvantaged students; use of information and communication technology (ICT) in the classroom; support for the teaching of Vietnamese to ethnic minority students and in a multicultural environment; and gender and cultural awareness programs. Four hundred and seventy-five (46.2%) of the core trainers were women. The project also provided scholarships to support the development of ethnic minority students in upper secondary school to become lower secondary teachers in their own communities. Over fifty percent of the transitional teacher training scholarships were awarded to females. Management training for headmasters benefitted 1,415 headmasters in 2010/11 - 21.4% of them were females and 11.6% were ethnic minorities. Overall, 3,021 school principals and administrators - of whom 681 (22.5%) were females - received training. As an incentive to retain teachers in remote areas, the project has constructed 467 teachers’ housing units. At least 950 teachers benefited, of whom 460 were females (48.4%) and 280 were ethnic minorities (29.5%). There should be continues public awareness campaigns through long term strategies that challenge social norms and perceptions. Local authorities need to take an active role in mobilizing children to go to school to compliment awareness-raising activities. Semi-boarding facilities with security and privacy for boys and girls reassure parents to send their children to school as they are reassured of the safety of their children, especially their daughters. Dormitories with sanitation facilities are particularly essential for girls’ safety and comfort. Provision of teachers’ housing units (for both female and male teachers) contributes to the improvement of teachers’ quality of life, including a sense of safety and security for female teachers. These facilities also served as an effective means for retaining more experienced teachers in remote areas. The semi-boarding school feeding program relieved the families of students of the burden to provide food for their children during the pre-harvest season. The success of the program encouraged the government to adopt a policy to provide rice for semi-boarding students. The pilot scholarship program for lower secondary schools helped both female and male minority students overcome financial barriers to transition from primary to lower secondary education. As a consequence, the government is preparing a policy to provide scholarships for ethnic minority students from the smallest ethnic minority groups. Teachers have an important role in improving equitable education for girls. Gender training should be promoted and integrated into formal education and teacher training to reduce stereotyping. Provision of scholarships for ethnic minority students (male and female) in teachers’ training colleges will help improve the quality teachers since they have an understanding of their own minority languages and cultures. However, the government must ensure that there are jobs available for the newly certified teachers in schools of the teachers’ ethnic group. Teachers’ improved skills in career planning strengthened their capacity for identifying career paths and counseling children and parents on the importance of lower secondary education, especially the need for girls and ethnic minorities to attend school. Realistic gender indicators need to be established at different levels as appropriate (i.e., province level, district level) for easy monitoring and determination of achieved targets. Asian Development Bank. Viet Nam: Lower Secondary Education for the Most Disadvantaged Regions Project. ADB. Viet Nam: A Dream Fulfilled in the Remote Mountain. Sakiko Tanaka is a focal officer for Vietnam social sector portfolio and working with her team on processing projects for secondary education, TVET, and health. Prior to this, she worked for ADB Economic Research Department as Senior Economist working on employment diagnostics in collaboration with ILO in Cambodia, Fiji, Bangladesh, Sri Lanka, and Indonesia. She also worked at ADB Pacific Department as a Social Development Specialist dealing social sector projects. She completed her Ph.D. in Social Policy from the Graduate School of Arts and Sciences at Colombia University NY. Elaine currently supports civil society participation in ADB’s operations through its NGO and Civil Society Center. Prior to this assignment, she supported health and education projects in Southeast Asia. Before joining ADB, she worked for a range of international and local nongovernment organizations. With more than 25 years of development experience, she has also worked in the field in Kenya, South Sudan, Azerbaijan, Somalia, Cambodia, and The Gambia.